Many businesses hesitate to provide information about their former employees to prospective employers because of the threat of potential lawsuits. Lawyers should understand the legal issues underlying employment reference checks to help their business clients establish best practices. 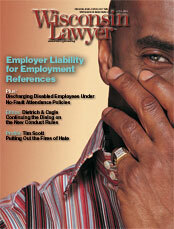 Employers should take care when discharging disabled employees under a no-fault attendance policy. To effectively counsel their business clients, attorneys need to know why the Wisconsin Supreme Court recently awarded a disabled employee the maximum remedy under the Wisconsin Fair Employment Act for an employer’s discriminatory application of a no-fault attendance policy. State Bar CLE Books has released its latest supplement to Wisconsin Employment Law, a comprehensive and practical guide widely used by Wisconsin attorneys and human resources professionals alike. Wisconsin Employment Law is recognized as the source for valuable, practical, and timely information on this complex and crucial practice area. "In Part" versus "Determining Factor"
Judicial and administrative application of the in-part and determining factor tests the WFEA decisions has not enjoyed uniform clarity. Read why. The 2008 State Bar Annual Convention gives you a great rate of return on your investment of time. To learn more about Tim Scott's presentation, The Holocaust: Its Relevance Today, or to attend or schedule an appearance, please visit Put Out the Flame . In his presentation, Scott challenges listeners to examine and extinguish the "flames" of bias, prejudice, racism, and hatred in their own hearts. Work progresses on president Basting’s focal issues: UPL, access to justice, and the influence of money on judicial elections. Attorney Timothy Scott takes his listeners inside a hateful episode in human history – and asks them to examine hate in our world today. In Part 1 of "A Dialog on the Rules of Professional Conduct for Wisconsin Attorneys," the authors discussed the impact of changes to Chapter 20, the Rules of Professional Conduct for Wisconsin attorneys, on informed consent and written agreements, lawyers' potential exposure to malpractice claims, and other issues. Dean Dietrich and Ralph Cagle discuss how breaching the professional conduct rules may affect legal malpractice claims, significant changes to the trust account rules, client confidentiality and conflict issues, and how the rules affect cross-border practice. Have you ever received a "low disk space" message while using your computer and puzzled over what is taking up so much space on your hard drive? Several programs are available that can analyze the contents of your hard drive and give you a visual representation of space usage. Christopher E. Ware, Michigan 1995, and Laura Gramling Perez, Michigan 1996, are the 2007 recipients of the Hon. Charles Dunn Author Award, presented annually by the State Bar Communications Committee. SCR 20:1.15(i) requires lawyers to annually certify that they are complying with trust account recordkeeping requirements. The Legal Services Corporation (LSC) announces the availability of competitive grant funds to provide civil legal services to eligible clients during calendar year 2009.